A contract is a funny thing because some people get upset over the mere mention of a contract. I can tell you from years of experience that anyone that has a problem with a contract is someone that you don’t want to do business with. If a person says something to you, but refuses to back it up in writing you should just consider everything they said to be BS. That’s not just for DJ business that’s for business in general. Years ago, venues seemed to be run by real men and women that would sit down with you and discuss business. Technology has bred a new brand of coward that will not say more than two sentences to you in person but will type you to death via e-mail. As far as social graces go, yeah, it’s annoying. From a business standpoint it’s a good thing because it gets the venue owner to inadvertently write a contract. Everything is typed in their own words, date and time stamped. From there you simply print it out and present it if and when a dispute arises. 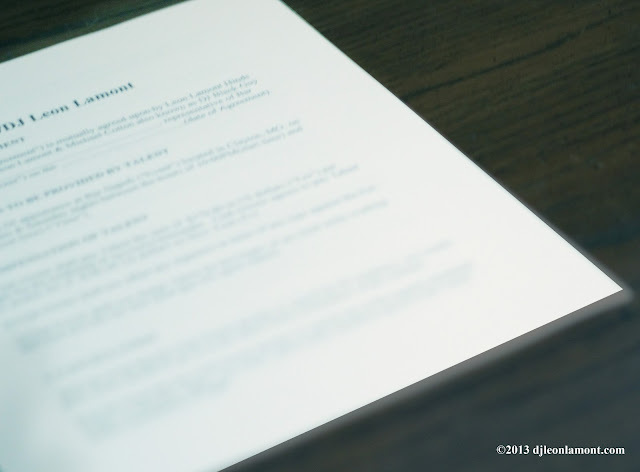 Contracts aren’t always necessary for smaller gigs, but in general using contracts is a good habit to pick up. If Sam Sausagehead the manager gets fired from the venue then the next manager that replaces him should be able to pick up a document and clearly understand your business arrangement.